The funny thing about working in the food media industry is that you often find yourself working on summer recipe ideas in the middle of winter. Similar to department stores that start thinking about Christmas ideas in the heat of the summer months, I've been writing summer recipes while the snow still keeps on falling. Thanks to indoor grills, I've been able to fairly easily recreate a summer outdoorsy feel in the middle of my kitchen - which overlooks perfectly white-covered roofs and tired, overweight trees. It almost makes me want to trade my warm sweaters for light summer dresses and flip flops.. I have a thing for salmon burgers - they're light and flavorful, easy to make and are a nice change from your traditional ground beef burgers. They can work wonders to brighten up a cold winter day (they sure did for me) but more traditionally make for great finger food in the summer, by a pool, with a cocktail. And there is just something about mini food items isn't there? In a food processor, add the salmon, parsley, capers, lemon zest and grainy mustard. Lightly blitz until the mixture holds together but is still chunky. Add the egg and blitz again. Place the mixture in a bowl and fold in the breadcrumbs. Generously season with salt and pepper. Shape the mixture into 10 round burgers using the palm of your hands. Grill on an indoor or outdoor grill. Cook for about 3-4 minutes on each side. While the salmon is cooking, lightly grill the brioche buns. Add the chopped herbs (parsley, dill and chives) to the mayonnaise. Taste and adjust seasoning if necessary. To serve, place a dollop of herbed mayonnaise on a brioche bun, add a couple leaves of baby spinach, a salmon burger, a couple slices of red onions and close with another brioche bun. Enjoy! I bet this tastes Goooood. Oh, I was looking at the picture wondering where you found the mini buns, what a great idea to use a brioche loaf. I'm not a big meat girl, so I just adore salmon burgers. It's a great, light way to get your burger fix. And that herbed mayonnaise sounds divine. I can't wait to try these--be it winter or not, I think a salmon burger is great all year round! These look adorable and oh so tasty. Thanks for using wild salmon too. So many restaurants have salmon burgers, but I won't order them because they are made of stupid farmed salmon. I bookmarked this in my reader to keep in mind as a future possible dinner. I so want these to show up at my house!!! Adorable! When oh when will winter be over? I'd love to try this recipe with sushi rice, formed into discs and grilled lightly, as the "buns". Should be very Westcoast/Pan Asian. Oh, here is what is for dinner tonight! 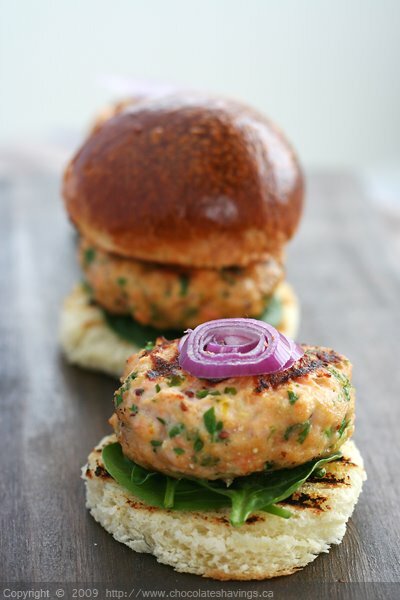 Yum, I would call these salmon sliders...either way - delish! I think this is the most adorable slider/burger i've ever seen! healthy too! I gotta try it out! thanks ! I love the idea of these mini salmon burgers and how delicious with a brioche! Those look so delicious!!! I love all the flecks of color. Sliders! But yours are way fancier than a slider. Another gorgeous creation, congrats. These sound so nice and flavorful - cute too! Love salmon burgers, and I confess that I buy the wild salmon burgers at Trader Joe's (but will try your recipe). I also serve them on rolls, with mayo "spiced" with a few drops of Louisana hot sauce. These look wonderful! Serving them on brioche makes them perfect! I see you're going for the same summer-in-winter theme as I am. I'm trying to will it into spring with my food! These look lovely, such beautiful photos. I see you're going for the same summer-in-winter theme as I am. I'm trying to will it into spring with my food. These look delicious - and lovely photos. This looks delicious! I love the combination of salmon and mustard. I will have to try this recipe very soon! This looks like the perfect food for a spring party! Thanks for sharing! Sounds really healthy and it looks really delicious! Love the colours too! I could TOTALLY get into this - looks fantastic! It's warm here in Australia (we're only a few weeks into Autumn) so your Summer Salmon Burgers are perfectly relevant here! I can't wait to try brioche as a burger bun. I love salmon burgers in any size, these look so good that I could eat at least 2-3 of them. Aren't you soooo ready for summer? Especially when you have to think about it through the long winter. I can't wait to get the grill out! So beautilicious--you're a master! Love it. Anonymous: I'm glad you enjoyed them! Those salmon burgers look good! Ummm, I can do with a couple of these burgers right now. Wow...that looks beautiful...you have a wonderful collection out here...loved your baked goods. Trying to find some finger foods that my entire family will like this holiday season. Might have to try these out.